With one leg extended in front of me, the other behind, and my fingertips supporting much of my body weight, my stance felt similar to a sprinter about to burst off the block. But in actuality, I was standing on a paddleboard. In a lake. Doing yoga. The next step was to remove my hands from the board and rest them on my knees, halving my points of contact and skyrocketing my instability. I steadied my focus on a brown patch of grass, but a fellow yoga-er, barely visible in my peripheral vision, seemed to be drifting her board straight toward mine. With shaking ankles, I released my hands, but realized any nudge from a neighbor would snap my fleeting center of balance. Stand-up paddle boarding (SUP) and yoga have melded together in a trendy aquatic balancing act. With SUP-ing being one of the fastest-growing sports in the nation, and yoga having hit widespread success with the masses years ago, the sport—Activity? Pastime? Classification proves elusive—seems well-positioned for popularity in Utah. 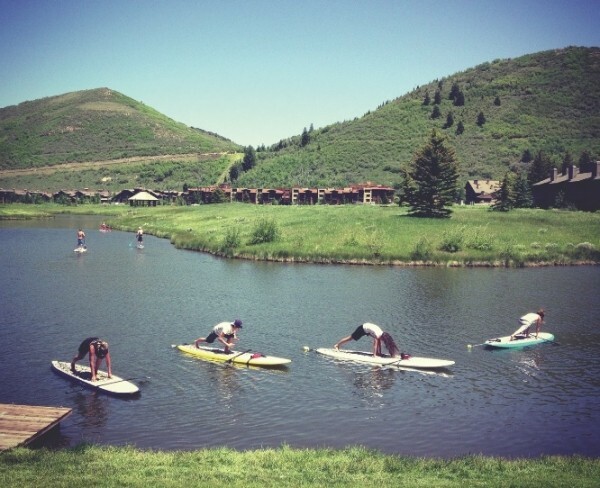 To investigate, I took Park City SUP’s intro yoga class on a small lake in Deer Valley. With only a few yoga sessions to my name and no official SUP-ing, I hadn’t a clue what to expect. Admittedly, I carried with me some skepticism—it’s impossible to know which popular activities are merely a passing fad—but I made sure to have an open mind once class began. As I pushed off the dock on the 11-foot-long plank, the sturdiness of the board assured me I’d avoid instant failure. I paddled around as a slow breeze cut through the mounting late-morning heat. Ducklings squeaked out adolescent quacks, minnows flashed through the eddies made by my paddle, and a sliver of moon crested above the rolling green mountains. As I built speed, the gentle smack of the hard plastic board against the ripples provided a light thrill. The instructor, Joie, eased our beginner group into activity with a zero-pressure, do-what-you-can, who-cares-if-you-fall-it’s-hot-out-anyway introduction. “Breathe deep and relax, dedicate this next hour to you, and just you,” she continued, and I already felt more at ease than I’d been 20 minutes prior while stuck in construction traffic. We began with simple sitting poses. With only six people in the class, the mood was personal. As the intensity ramped up, a few fledgling yoga SUP-ers plopped into the lake while trying to connect hands to ankles to boards, and turn and stare, and stretch and balance, and breathe and point, all at the same time. No problem, though—like Joie said, they just climbed back up and kept at it. While I thought the initial test paddle was easy enough, the class soon required all my physical and mental focus. We went through poses such as cat-cow, downward dog and warrior 1 (or Virabhadrasana, for those in the know). The instability factor of being on the board is the key to the benefits. You are simultaneously engaging your core, strengthening muscles, stretching and improving balance. The biggest challenge was an invite to try crow pose. To start the pose, the palms sit flat on the board while the body is in a crouching position and the knees are leveraged in or just below the armpits. I crouched low and, with my knees pinching my arms, envisioned toppling forward in somersault lake plunge pose. The technique is to roll your body weight forward and stand on your hands as your feet leave the board, essentially in a compacted handstand. I, however, slowly added more weight onto my hands, then pushed off and grunted through a half-second of being suspended upside-down. Even though I had radically improper form, it felt like progress. Hopping back onto stable ground after the class, I felt energized, tired and eager to improve, all at the same time.